This week Archives and Collections Volunteer Lucy Janes shares another of the discoveries she’s made during her research on the WW1 Home Front research project. 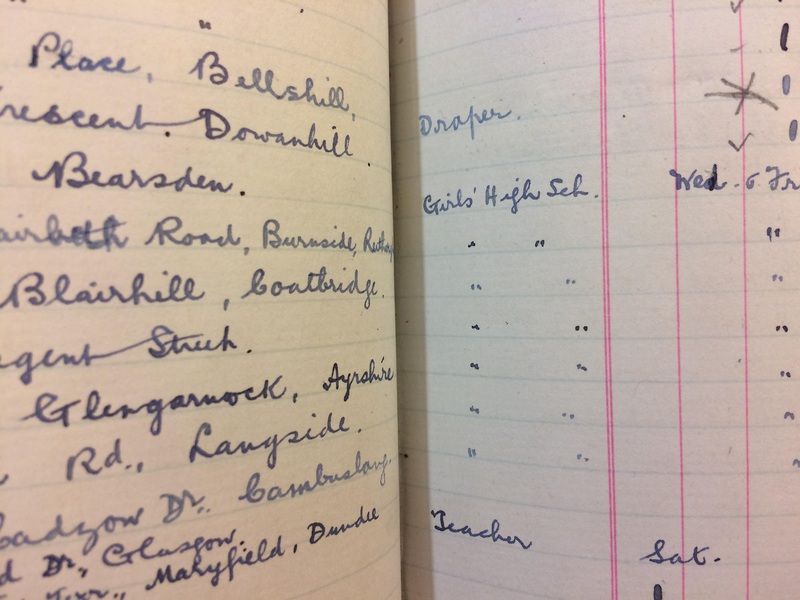 I was intrigued when researching a couple of young women who attended The Glasgow School of Art in the early 20th century to discover that they had started coming to classes when they were still pupils at the High School For Girls. Olive Mary Vaughan, of Cathkin Road in Langside, was 17 when she started doing afternoon Drawing and Painting classes in 1910. In the following year, also as a school student, she carried on these classes and studied Modelling too. That year she was accompanied by two other pupils from the High School for Girls: Annie Geraldine Lyles and Isabel Brodie MacDougall. From 1912 she’d left school and did some classes during the day until 1915 when she switched to evening classes in Design. As far as I’m aware she didn’t graduate so her studies were perhaps for her own pleasure and education rather than to prepare for work. Edith Margery Vaughan – Olive’s younger sister – started studying Anatomy and Modelling in 1912 when she was about 16. Six other young women, all from the High School for Girls, did the same classes as her. Edith continued her studies at The Glasgow School of Art the following year, as did Beda Ramsay. So what were the links with schools? 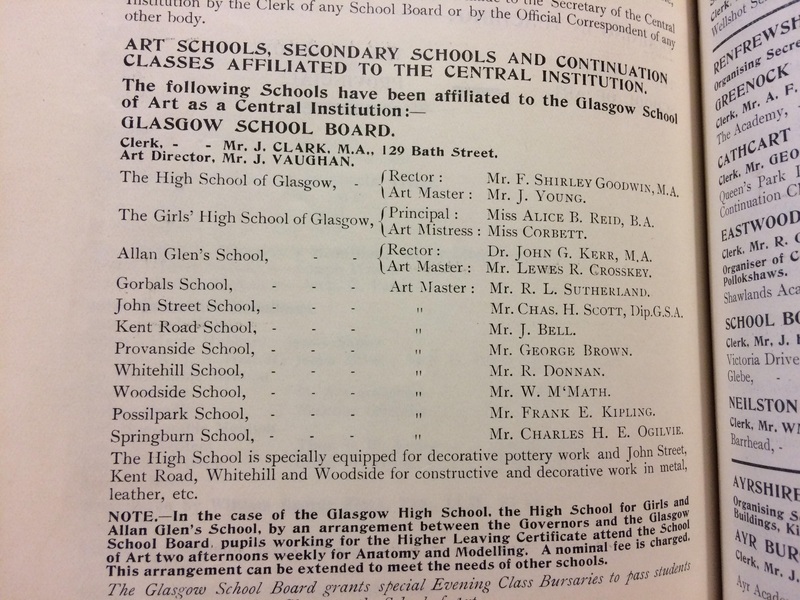 “The scheme of instruction in Drawing, given in the Continuation Classes of the Glasgow School Board, has been agreed upon between the School Board and the Governors of the School of Art, and this same scheme has been accepted by the School Boards of Govan, Maryhill, Cathcart, Eastwood, Shettleston, Springburn, Greenock, Rutherglen, Neilston and New Kilpatrick…. As well as local high schools, the Glasgow School of Art had established connections with other institutions of further education and training in the city. Edith’s career at the Glasgow Art School didn’t end after two years a school pupil. She returned in 1915-16, after a gap of a year, to take evening classes in Design. This time she was enrolled as one of group of women from the College of Domestic Science, whose ages ranged from 18 to 37 years old. We’ll be doing research to find out more about each of them. 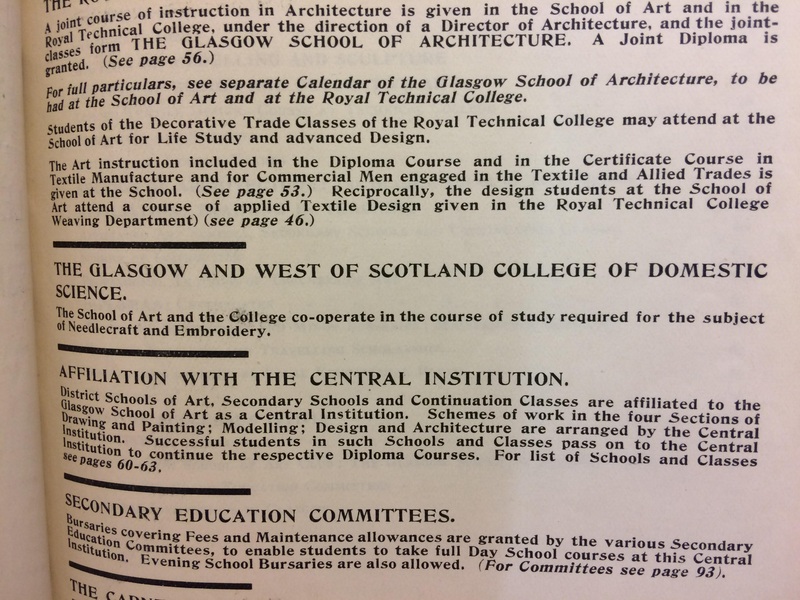 The Glasgow and West of Scotland College of Domestic Science is listed in the 1913-14 prospectus under the heading “Co-ordination of work with educational bodies”. It explained: “The School of Art and the College co-operate in the course of study required for the subject for Needlecraft and Embroidery.” (pg 3). This course was taught by Miss Ann Macbeth (chief instructress) and Miss Annie Knox Arthur (deputy). GSA Prospectus, 1914, with information about the links between GSA and the College of Domestic Science. You can see more about the history of the College of Domestic Science in the Glasgow Caledonian University archives. There’s more to be learnt about these links and affiliations; the Cataloguing GSA project will help to offer insights, for example in these records from the early 19th century, which could help to find out more about how far the links go back, how they were established, how long they continued or how they changed. 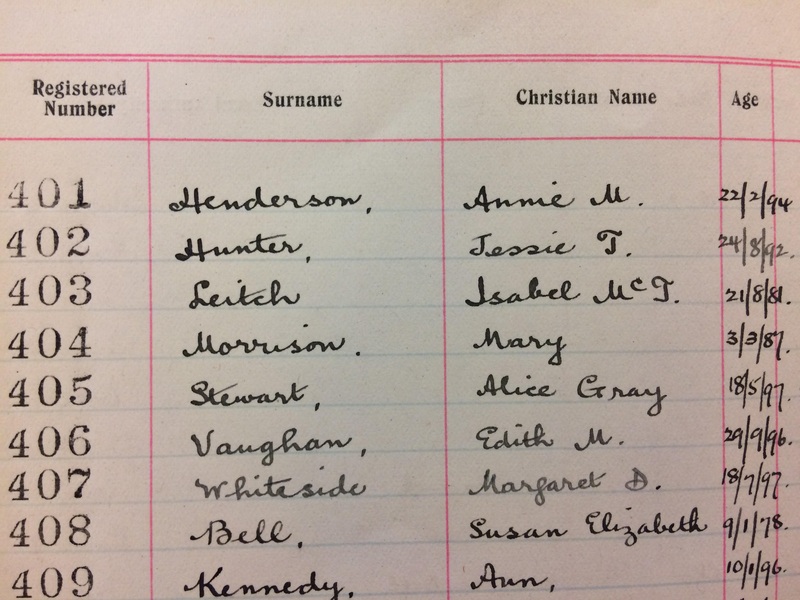 We don’t know any more about Olive and Edith Vaughan – perhaps a family genealogist out there does, and if so, please get in touch! – but this glimpse at the few years they spent at the GSA has revealed so much, not only about their lives as young women in Glasgow before and during the First World War, but also a little more of the story of what the Glasgow School of Art has offered to the people of the Glasgow.